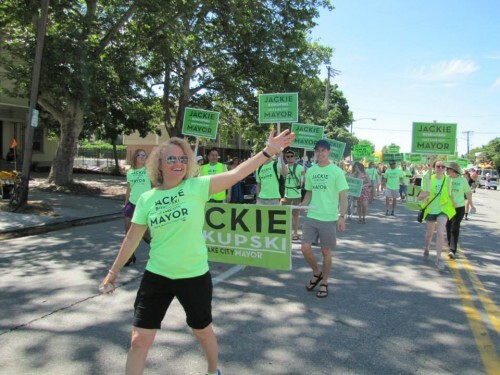 Jackie Biskupski is running for Mayor of Salt Lake City in 2015. I’m running for mayor because I care about the people who live and work in this great city and I feel that they’re not being included in the decisions that affect their lives. As a taxpayer, I care about our local economy and the fact that we’re not keeping up with the expense of running this city. As someone who believes in being strategic, I care about transportation and how we’re making arbitrary decisions rather than working from a master plan. As a mother, I care about our air quality and the lack of long-term sustainable solutions. I served for 13 years in the Legislature and have been a member of the administrative team of the Salt Lake County Sheriff’s office for the past 8 years. I have the leadership skills and the policy making experience to be the strong, collaborative leader this community needs. What is your vision for cycling (both road and mountain biking) in Salt Lake City? What would you do to make that vision happen (planning, budget, infrastructure, education, safety, economy, etc.)? As mayor, I will focus on cooperation and coordination with bicyclists, pedestrians, and drivers. I want to create a city where bicyclists feel safe, where those that live and work in the city are encouraged to bike to work, where plans are made with the input of all stakeholders, and where other environmentally-friendly types of transportation (transit, carpooling, etc.) are available and accessible. What is the biggest issue for cyclists currently in Salt Lake City and what will you do to address it? I believe the biggest issue for cyclists is safety. As any cyclist will tell you, we ride with the assumption that no one sees us, and unfortunately, too many of us know cyclists who have been seriously injured or killed. The current administration has failed to address this growing concern. I support a comprehensive bicycle safety plan that prioritizes the completion of the Parley’s Way/Jordan River Parkway connector, that creates continuous bicycle lanes throughout the city (not just arbitrary street by street projects), and that has a public education component to educate residents about bicycle safety. As mayor, I will prioritize a master transportation plan that integrates all types of transportation and includes input from all stakeholders. Mayor Becker has a proposal on the table for a $150M open space bond. I plan to scale back that proposal to a more realistic plan that focuses on biking and hiking trails, phases in additional open space, revisits the closure of the profitable Glendale golf course, and better balances our needs with our resources. What will you do to grow the cycling economy of Salt Lake City (i.e. bicycle based business and industry, as well as communities that benefit from bike improvements)? As part of my plan to revitalize the west side of Salt Lake City, I plan to extend the GreenBike program west as well as into high-use areas such as parks and other key public locations. Cyclists and the businesses that support them are innovative and forward thinking–the kind of business we should be trying to attract. I have a strong small-business plan that includes fostering a startup and small business friendly environment. Small businesses in Salt Lake are negatively impacted by too much bureaucratic red tape the needlessly wastes their valuable resources. For example, Salt Lake City currently has an employee fee, a fee charged to employers each time they hire a new employee. I believe we should encourage hiring not penalize it and will work to eliminate this fee. We must also streamline our planning and zoning departments to ensure more efficient and effective service. I will stop the wild growth of city fees, by freezing annual automatic fee increases, and increase transparency around fees by publishing, annually, a list of changes to fees. UDOT Roads are important corridors for bikes as well as cars. What would you do to ensure that UDOT and SLC implement bike facilities on these roads? Currently, Salt Lake City is operating without a current Master Transportation Plan. This means that decisions are made without a long-term strategic vision. This requires the creation of a master transportation plan that incorporates all types of transport, including bicycles. Currently road improvements, new transit lines, etc. are created in an arbitrary way rather than as part of a larger strategy. By operating from a master plan we will be prepared to better incorporate bike lanes and bike facilities along our key transit pathways. Regarding the attached proposal 10,000 Wheels for Affordable Transportation, what are your thoughts and would you commit to working to implement this if you are elected? The 10,000 Wheels proposal is very innovative and has a lot of great ideas. I will commit to working through every aspect of the proposal with key transportation staff and community stakeholders that would be impacted by the proposal to thoroughly vet each item, conduct a cost/benefit analysis, and incorporate the best pieces of the proposal into our master plan. Many of the elements will require financial allocation and I am committed to working with the City Council to ensure appropriate funding for the targeted projects. Regarding the attached proposal for a comprehensive recreational cycling plan for Salt Lake City, what are your thoughts and would you commit to working to implement this proposal if you are elected? The recreational cycling plan has very good ideas for expanding the trail systems and other recreational opportunities for bikers. As I committed with the 10,000 Wheels proposal, I will work through the proposal with the appropriate stakeholders and implement those pieces that fit within a master transportation and growth plan for the city. I am committed to expanding our open space and better utilizing our current open spaces. The 2015 Bicycle and Pedestrian Master Plan is in draft format and is with the SLC City Council. What will you do to ensure its implementation? Are there improvements that you would like to make to the plan? I believe the current Bicycle and Pedestrian Master Plan is good but we need to ensure that it is connected with a larger master transportation plan. Arbitrary road-by-road decisions are not helpful to bicyclists and they confuse residents. The current 300 South bike lanes have been a cause of great concern for downtown Salt Lakers. As currently configured, they cause issues for parents entering and exiting vehicles with children, they pose safety concerns by crossing through oncoming bike traffic, and they have created additional burdens for people with disabilities. I support bike lanes but they must be create with a long-term vision and as part of a more robust master transportation plan. We want bicyclists, vehicle traffic, and pedestrians to all feel safe and welcome in Salt Lake City. What will you do to work towards Zero Fatalities (i.e. Vision Zero) for cyclists and pedestrians in Salt Lake City? I am deeply concerned with the number of bicycle accidents in our city. The current administration has not done enough to educate the public about how bicyclists, pedestrians, and drivers should operate together. We need a uniform system of bike lanes throughout the city with the same rules in all neighborhoods, not one arrangement on 3rd South and a variety of other rules and configurations on other streets. Do you ride a bicycle? Tell us more about how and where you ride. I love biking. I enjoy riding my bike on trails and in the city, although I share the concerns of other riders over our safety while on the road. I have a young son who is just learning to ride a bike and I hope to instill in him a love of biking as well as a keen sense of environmental responsibility. 10. Is there anything else you would like to add? Air quality will be one of my top priorities as mayor and bicyclists are a vital component to that plan. I commit to working closely with the bicycling community to create much-needed and well-planned improvements to roads and I’m committed to promoting bicycling and public transit use as an alternative to vehicles. I will incorporate bicycle alternatives into my plan for west side revitalization, including expanding the GreenBike program west of I-15.